Mobile has become a global lifestyle today and mobility solutions are among the top-notch technology products in demand. Appian is the market leader in the contemporary BPM (Business Process Management) software as it proffers an enterprise application development platform possessing the capability to unite the users with all their processes, collaborations and data into one secure environment over a mobile device. services, Appian BPM Integration & Implementation service provider along with the flexibility to hire Appian developer India to aid our clients with dedicated end-to-end Appian based application development. We are experts in transforming your application development project into competitive and strategic business advantage for you by significantly reducing your time to market by deploying the most efficacious development methodologies and advanced tools. A BPM, by managing the business processes emphasizes on improving the corporate performance by effectively managing and optimizing the business processes of a company. 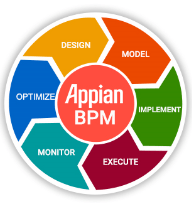 Appian BPM is one of the leading BPM Solutions that deliver increased workforce productivity by automating repetitive tasks and streamlining business operations. With Appian’s a PaaS (Platform As A Service) Application, one can rapidly develop, deploy, use and scale diverse problem-solving applications, as Appian comes with the flexibility of cloud and on-premise portability which makes addressing the unique challenges of an organization easier and efficient. We are a world-class Appian Technology company in India that offers unmatched Appian BPM Development Service & Appian BPM Integration & Implementation service provider. It supports the rapid development and deployment of natively mobile business applications. It possesses a host of business tools and dynamic user interfaces which work instantly and effectively across the mobile and web devices. It has the process management capabilities for building the process and task orchestration efficaciously. Appian records have the capability to provide everything relevant and topical from across the systems. It supports multi-channel deployment and rapid adoption. Tech Tammina a leading Appian technology partner company in India that offers unmatched Appian BPM Application development, Appian BPM Integration & Implementation service provider plus Advisory Services to clients at highly affordable prices. Built on a wealth of market-aligned processes, our industry expertise along and vast experience across a broad spectrum of development platforms & technologies, our app development services harness this expert capability to develop innovative and pioneering solutions that can take your business successfully in the digital economy with a competitive edge. Contact Us to know more about our development services and to discuss your project requisites.